July 24, 2017 – This week, we introduce children to the woman behind the Vietnam War Memorial in Washington D.C. 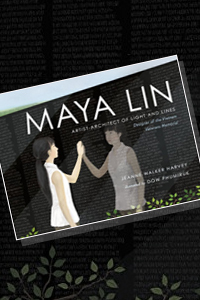 The book (for young readers ages 4 to 8) is Maya Lin: Artist-Architect of Light and Lines , by San Francisco children’s author Jeanne Walker Harvey. Just how did a college student managed to win the design competition for what’s now the most frequently visited monument in the nation’s capital? To answer that question, we called up a pinch hitter to conduct the interview: Thriller author, practicing architect and father of five Tom Grace. You’ll recall Tom’s chats with best-selling author Gerald Posner on his book God’s Bankers: A History of Money and Power at the Vatican and with Hugh Howard on his book Architecture’s Odd Couple: Frank Lloyd Wright and Philip Johnson . You can enjoy those interviews in our archives wherever you’re listening now, or stream it at those HistoryAuthor.com pages. Visit our guest at JeanneWalkerHarvey.com or @JeanneWHarvey on Twitter. You can also check out her weekly blog, True Tales & a Cherry on Top, where Jeanne has reviewed over 140 picture-book biographies.